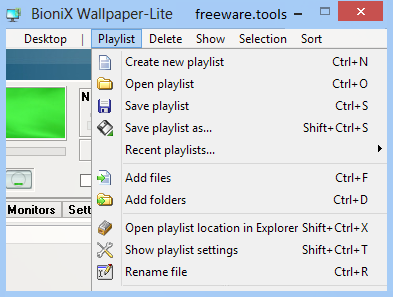 Bionix Wallpaper Lite is an extensive desktop wallpaper management utility. It simplifies the process of creating, saving, and cycling your desktop wallpaper displays. It supports a wide range of image formats, with more added regularly via regular updates, as well as drag-and-drop, hot keys, variable window opacity, dual monitors, and magnetic windows. It can display the current time as wallpaper, too. It provides a sample Playlist containing a few images that might not suit younger or more prudish users, though it's easy enough to deselect or even delete any or all of them. BioniX Wallpaper-Lite is a lightweight desktop enhancement application specialized in automatically changing your wallpaper and downloading images from websites. The utility implements a GUI that looks similar to one used by audio players. You have access to a set of audio-like control buttons that allow you to start or stop the automatic changing mode and set the previous or next image as your wallpaper. The configuration panel hides lots of tweaking parameters. If you don't need them, you can hide them from your view and enable the minimalistic layout that embeds basic buttons for managing wallpapers. Tooltips are displayed each time you hover your mouse cursor over a specific feature in order to get details about its functionality. BioniX Wallpaper-Lite allows you to build up thematic playlists that store the images you want to set as wallpapers. You may save them to your computer and import them in your future projects. Plus, you can build up a list with photos added from your PC using the drag-and-drop support or import the content of an entire folder. In addition, you may clean the playlist by deleting nonexistant and duplicate items, rename and rate photos, download batch pictures from Flickr, grab photos from a custom website, as well as automatically display light wallpapers during the day and dark images during the night. Furthermore, you can monitor a custom directory and automatically update its content if you add or remove photos, show or hide the desktop icons and taskbar, shuffle wallpapers, and press the 'Panic' button in order to automatically change the current wallpaper with a different picture. All in all, BioniX Wallpaper-Lite integrates an advanced set of tools that can be used for personalizing the looks of your desktop.